Russia’s foreign ministry made it clear Thursday night that it’s not at all in favour of Norway allowing US troops to be stationed at Værnes outside Trondheim. 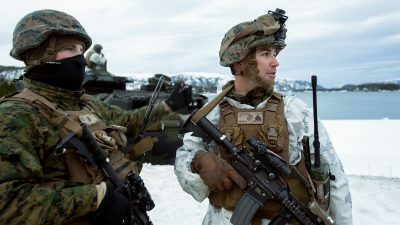 “Norway is choosing American soldiers over economic cooperation with Russia,” a spokeswoman for the Russian foreign minister told Norwegian Broadcasting (NRK). “We don’t understand why something like this is being done, in a time of peace,” Maria Zakharova, director of information at the Russian foreign ministry, told NRK. She was making an official response to the Norwegian government’s confirmation this week that 330 US Marines will be stationed at Værnes on a rotation system beginning in January. Norwegian Defense Minister Ine Eriksen Søreide has insisted that it won’t be a “base” but the Russians aren’t buying her assurances. Zakharova said the Russians are also concerned that such a base will be located in the center of Norway, far from the actual border to Russia. “It’s just an attempt to camouflage that both training and exercises will now take place all over Norway,” she said. After years of cooperation following the collapse of the Soviet Union and the end of the Cold War, tensions between Russia and western nations began to rise with the re-emergence of Vladimir Putin as president of Russia. He has been keen to rebuild Russia as a major force in the world, but his decision to annex Crimea and intervene in Ukraine sparked international protests and prompted the EU and US to respond with economic sanctions to which Norway has adhered. At the same time, Norway and Russia have generally had a cooperative bilateral relationship, even during the Cold War years, based on a long history of cooperation in the far north, where the two countries share a border. While many contend Russia initially provoked Norway and its allies with the annexation of Crimea, Russia now seems sensitive to any counter-response to the annexation. Zakharova’s message to NRK was that Norway should “think through” its intentions in allowing US soldiers to be stationed in Norwegian territory. Norwegian and Russian cooperation, she suggested, was now being put to the test.